I'm really rubbish at this blogging thing. I promise I'll try and be a bit more regular. I'm just not sure where all the time has gone. What with work and football and general hecticness I don't seem to have had time to do anything recently. Still the World Cup is all over now and I think the right team won. So now we should be able to get back to real life, though I'm missing the football already. It's great for getting lots of knitting done, even if England matches do make for dropped stitches and much yelling at the screen. I went to Woolfest and had a great time. I was quite restrained in my buying. I bought a bobbin winder as I was totally fed up winding them by hand, and I bought some fibre to spin and some yarn to dye, but mostly I just wandered round looking at the lovely colours and beautiful displays and filling myself with inspiration. It was very hot and very crowded and we'd had an issue (or two) with our hotel stay the night before so I was feeling a bit tired and grumpy which kind of took the edge off the day. I haven't really got a lot of knitting news to report. I've been knitting a present for someone and as usual I've forgotten to photograph it before giving it to the recipient so I have nothing to show for all those evenings in front of the football. I did a bit of dyeing yesterday though and had some really good results. The four hanks of purple across the top are in fact one skein. I was trying to get a graduated effect from a silvery grey through to a deep purple along the full length (all 800m) of a skein of laceweight. I'm not sure it turned out quite right. I might need another go at that. I'm thinking that 4 gradations of shade are not enough, but it's a bit tricky to do even with 4 so more than that might be a tad too tricky. The aim is to be able to knit a top down shawl so that it starts pale and gets darker towards the edges. 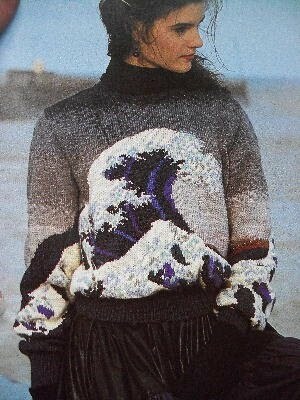 Now I'd never wear a jumper like that, but I loved the image and thought it would make a great cushion. The pattern is from a book found in a charity shop (in Tewkesbury I think). 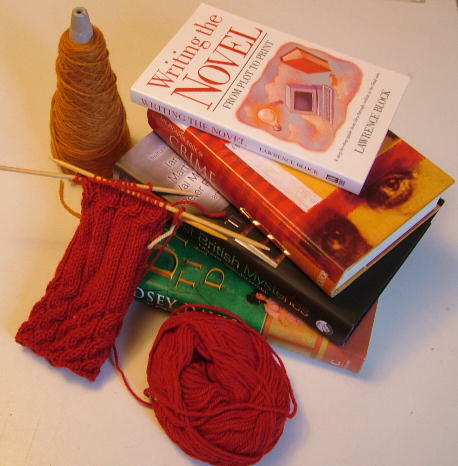 The book is The Knitting Book, published by Conran Octopus in the 1980s. I think it was originally published in France as it uses a lots of French and other European yarns. Most of the patterns are very 1980s but I couldn't resist the book just for this one chart. So I've been planning carefully and have dyed all the greens and blues and greys needed, just need to do a few browns. There are 13 different colours in this and a whole lot of intarsia. You may remember that intarsia is not my favourite knitting technique, so there may be swearing involved in this project. I've done 3 rows so far and can see that keeping the many bobbins of different coloured yarns untangled could be the major source of the swearing (and I'm only using 4 or 5 colours so far). We've been out and about a lot recently, with trips to Preston and Lancaster (on the way to Woolfest), to Ashbourne, Buxton and Matlock on Friday this week and Fareham and Winchester yesterday. That's a lot of charity shopping and so I did score a few bargains with some quilting books, a couple of jewellery making books and a few knitting books. The best result was from Worcester (on the same day as Tewkesbury, a couple of weeks ago now) when I got these in Oxfam. Yes, that's Shirley Paden's Knitwear Design Workshop and Northern Knits by Lucinda Guy. I paid £7.50 for the two. I think I might have done a little happy dance outside the shop. So that's everything all up to date with the textile stuff. You'll have to wait till next time for the books I've read though. It's been so long I'm not sure I remember what I've read. I promise it won't be as long till the next post, honest!